Alphabet Puzzle Cards, $4 each. We love pieces from old children's games and puzzles - but that shouldn't come as a surprise! Enjoy the word stencil cards jazzing up our wall (remember these from your old Fisher-Price chalkboard? 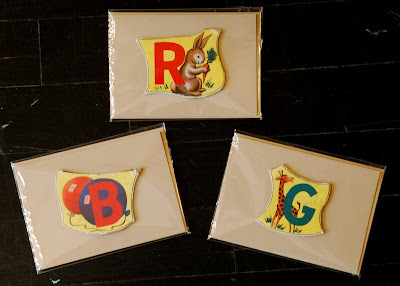 ), and take a peek at the new alphabet puzzle greeting cards the next time you are visiting our Andersonville location. In the meantime, dig out some of your old childhood puzzles and repurpose them into something fun! We would love to see the results!